Kids' Book Review is delighted to welcome debut author Christopher Richardson, who shares the story of his journey to publication. Be inspired by Christopher's passion for writing, and his endurance, as he describes the experiences that finally brought about the publication of Voyage of the Moon Child (Penguin, 2015). My parents were not particularly intrusive during my education. The one time they felt compelled to act was when my primary school created an invitation-only English enrichment class, and I was not invited. My teachers relented. The first task was entering a national creative writing competition, and I won the regional prize. Along with $1000 worth of books, the prize included a masterclass with the late great Diana Kidd. That encounter left an indelible impression on my twelve-year-old mind. For the first time I saw writing as a profession, not a hobby. From that day on, there was never anything else I wanted to do. Ten years later, in the winter of 2003, on a bus from Thredbo the driver screened The Spy Who Loved Me. A decent enough film, true, but one I knew by heart. So I scribbled story ideas instead, and wrote the following: A small girl stands on a floating city in the shadow of a giant ship, the last of the giant ships. Her life is in danger. Suddenly, I was off. From that moment, to tell the tale of Anni Tidechild was my calling. At the end of 2004, having finished my first degree, I travelled Britain, Europe, Turkey and Morocco. My mission was to see the world and finish the novel. I particularly relished writing in places like the flooded world of Salila in my tale, the Cyclades, or Mediterranean coast of Turkey. After six months of travel, I rested with a friend in Fiesole, outside Florence, where I finished a first draft of Anni and the Giant. It was late 2005, ten years before the book was published. So high was I on storytelling that in Barcelona, in early 2006, I started a sequel. Triumphant, on my return home I sent the manuscript to two professionals in the industry, an agent, and the colleague of a friend in publishing. At the end of 2006 I heard back, plunging for the first time into the reality of sharing one’s words with the world. The agent loved the first half of the novel, but was unmoved by the second, whilst the publisher loved the second, but felt unmoved by the first. Naturally, I went to India to clear my head. Late 2007, I took a job in publishing, hoping to learn from the inside out, joining the ranks of those toiling in the book world whilst carrying an unpublished manuscript in my briefcase. Whilst I found myself blessed with friends and allies offering invaluable advice, by the end of 2008 I seemed no closer to a deal. In a fit of creativity, I wrote a different – much shorter – novel over the Christmas break, but was rejected by the only publisher I showed it to. I left my job, enrolling in a Masters. It felt time for something new. In a final moment of grace, a senior publisher who had read my first novel bought me a gin and tonic, looked me in the eye, and said: “You are a writer. This book will be published. Don’t give up.” No one had ever said that to me before. Not like that. But then, in the ultimate blow to my sense of self, my father’s health declined, and he died in September 2010, when I was twenty-eight. During the two years leading up to that loss, I only had enough energy for my Masters. My novel waited in a drawer. Those words of hope became a memory. By mid-2011 my strength returned, coupled with a new devil-may-care attitude. After rewrites, I sent the manuscript off again, to three publishers I had avoided until then, perhaps fearing that, when their doors had closed, that would be the end of it. The first responded with a polite no thanks. Then, lo, like the two proverbial buses coming along at once, the others wrote within weeks of one another, expressing interest in what was then called Children of the Wave. So here I am in 2015. 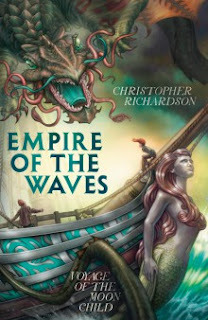 Empire of the Waves: Voyage of the Moon Child is on the shelves, after an exhilarating, thrilling, and demanding few years editing and rewriting with Penguin’s extraordinary publishing and editorial team. On the one hand, I have lived the fairy tale, plucked from Penguin’s pile of unsolicited manuscripts. Yet twelve years separates today and that wintry ride when first I decided this was the tale I had to tell, over a decade of work, hope and loss, adventure and despair. Yet I always went back to that manuscript, to those characters I loved, and story I believed in. A lot has changed in that decade, yet the heart and soul of the tale has not. This novel is the epic of Anni Tidechild. But it is also, very much, my own as well.